Death has inspired some of the world's most imposing and monumental architecture. Two of the seven wonders of the ancient world were tombs: the great pyramids of Egypt and the mausoleum of Halicarnassus. The latter was the tomb of Mausolus (hence the word mausoleum ), the king of Caria (Asia Minor); it was constructed in the fourth century B.C.E. but no longer survives. The Egyptian pyramids have endured and are perhaps the most famous tombs of all time. Their sheer scale captures the power, wealth, and energy at the disposal of those who created them. The word tomb derives from ancient Greek and was first employed by Homer to describe a tumulus or mound raised over a body. By transference, tomb has come to mean anything that is the last resting place of a corpse or cremated human remains. For this reason, the word tomb is often used interchangeably with funerary memorial, funerary monument, mausoleum, and even with cenotaph (an empty tomb), gravestone (a tomb marker), and grave. All can be said to perform some functions of a tomb. A tomb is a structure built aboveground to house the remains of the dead. Many such structures are freestanding, but some exist within other buildings, most notably churches. 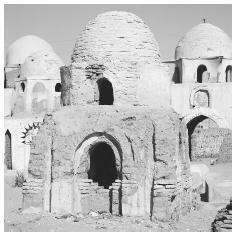 Tombs often incorporate architectural features and sculpture into the design; many include identifying inscriptions and images; and some use extravagant decor and furnishings on the interior as well as the exterior. Tombs come in a myriad of shapes, forms, and sizes: there are pyramids, obelisks, mounds, rotunda, rock-cut tombs, house tombs, and temple tombs, to name a few; these may house the remains of a single person or many. Some types of tombs are characteristic of specific peoples and places, but funerary architecture has an eclectic nature that often borrows forms from past societies to lend prestige to the present. Pyramid tombs may be associated with Egypt, but pyramids were also adopted in ancient Rome (e.g., that of Caius Cestius), in eighteenth-century England (e.g., that of the Earl of Buckinghamshire at Bickling, Norfolk), and in nineteenth-century America (e.g., the monument to Confederate soldiers in Richmond, Virginia). Most building types can be and have been adapted to house human remains and thus perform the function of a tomb. The earliest impact of man upon the natural landscape was through funerary structures. The barrows and tumuli of the Neolithic period in Europe (c. 4000–3000 B.C.E. ) or of the Mycenean period in Greece (c. 1600–1200 B.C.E. ), for example, were large tombs that basically consisted of a stone chamber covered by a massive mound of earth. We can judge that these were highly visible statements expressing the ability of the constructors to deploy manpower and resources, even when little else is known of the prehistoric societies involved. Tombs are a striking way of asserting desired power and stability. Monumental tombs are not a part of all cultures, religions, or political systems, but where they occur, they are often associated with times of transition in power, a transition frequently triggered by the death of a ruler. This is well illustrated by the pyramids of the Egyptian pharaohs or the mausoleums of the Roman emperors or the medieval papal tombs. The first Roman emperor, Augustus (ruled 31 B.C.E. –14 C.E. ), asserted his claims to rule in Rome by building a large circular mausoleum, a dynastic tomb designed to hold the remains of Augustus and his successors. The message was clear: Augustus and his family were in charge and they intended to remain so. In the twentieth century similar principles underlay the construction and maintenance of the tomb of Lenin. Reverence for the dead, and tombs that house them, can be a unifying factor and thus those holding power can draw authority and legitimacy by association with the tomb. From the top of the tomb that housed Lenin's embalmed remains, Soviet dignitaries watched the May Day parades; Lenin was literally under their feet and symbolically holding up the regime. Tombs may function as symbols of power, but one should not isolate them completely from a more personal world of emotion and sentiment. Although in Egypt, the Fatimid Tombs in this ancient Muslim cemetery are uncharacteristic of triangular pyramids usually found in that country. For past societies it can be difficult to reconstruct emotions. The Taj Mahal ("abode of the chosen one") in Agra, India, was built during the 1600s by Shah Jahan for his wife, Mumtaz Mahal, and could be interpreted as a beautiful token of love inspired by grief. This may have been so, but its wider political and physical impact cannot be ignored. The Taj Mahal was part of a massive building project that asserted Mogul rule onto the landscape of northern India. This tomb and its beautiful gardens may also represent heaven on earth, uniting this life with the afterlife. Indeed, spiritual and religious beliefs may strongly influence tomb design. On the one hand religion can seek to control and simplify, designating permanent monumental structures as inappropriate. On the other hand religion can inspire great funerary architecture and play a fundamental role in the design, form, and location of tombs. The secure construction and interior provisions of the Egyptian pyramids were dictated by beliefs about the afterlife; the filling of European churches with tombs had its origins in a desire to gain proximity to God. Religion, power, and sentiment could all play their part in tomb construction as epitomized by the Taj Mahal. In the case of more modest tombs, it is sometimes possible to view them less as public symbols of power and claimed religious piety and more as personal statements of affection and familial duty. The tomb is a product of the human urge to remember; it is a focus for memory and a symbol of consolation to the bereaved. In nineteenth-century America and Europe, following cemetery reforms and the abandonment of overcrowded churchyards, there was a boom in tomb and gravestone construction because more people had the opportunity and ability to mark the graves of their loved ones. It was a fashion that did not last, since the same cemeteries came to be characterized by greater simplicity in the twentieth century. Such changes in the significance and use of tombs reflect changes in society. But wherever and whenever they are constructed and on whatever scale, the public nature of a tomb must not be disregarded. A tomb may be commissioned from love and affection, but simultaneously its design, decor, and size are careful choices that convey important messages (even if indirectly) about the personal beliefs, wealth, status, and identity of the deceased and the survivors. Colvin, Howard. Architecture and the After-Life. New Haven, CT: Yale University Press, 1991. Curl, James. A Celebration of Death: An Introduction to Some of the Buildings, Monuments, and Settings of Funerary Architecture in the Western European Tradition. London: B.T. Batsford, 1993. Davies, Penelope. Death and the Emperor. Roman Imperial Funerary Monuments from Augustus to Marcus Aurelius. Cambridge: Cambridge University Press, 2000. Jupp, Peter, and Clare Gittings, eds. Death in England: An Illustrated History. Manchester: Manchester University Press, 1999. Parker Pearson, Mike. The Archaeology of Death and Burial. Stroud, England: Sutton, 1999.